We make new memories every day of our lives, but some fade into the background. Some emerge only with prodding, while others never return. Sometimes, though, a moment imprints itself indelibly in our psyche. It’s a game-changer, an instant in time that turns us in a new direction. These stay with us. Of course, there are wedding days, the birth of a child, etc. These are a given. But I want to talk about a carrot. The carrot. 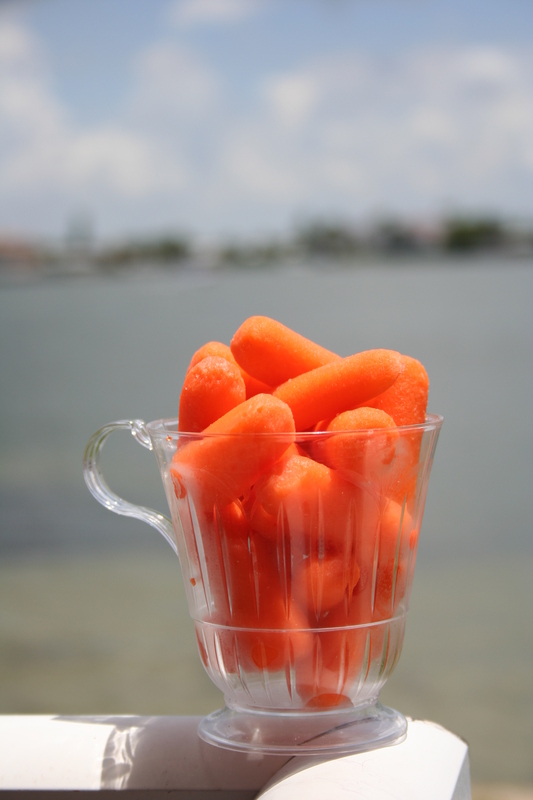 I never liked carrots as a child, especially raw ones. I spent much of my childhood and well into my 40s ignoring them. Never mind that they’re good for eyesight or high in fiber. I considered the carrot boring and tasteless. When we still lived in Houston, I visited one of the local farmers’ markets from time to time. You know, when I thought of it. A couple of friends of mine, who had turned their entire yard into a garden, sold produce there, so I always ran into people I knew. One day I bought some carrots. I don’t know why. Maybe I wanted to try something different. Or maybe, just maybe, something in the ethers whispered in my ear that magic was afoot. Further adding to the mystery of that day, I ate one right there at the market. And that’s when the heavens opened up and angels sang (well, maybe it didn’t happen quite that way, but you get the idea). From the first bite, I was hooked. The flavor made a big Pow! in my mouth. So sweet! So rich! I wanted to dance. I wanted to sing. I felt as though I’d never eaten a carrot before. From then on, we went to the farmers’ market every week. I learned to grow a garden. A few years later, we even moved cross country to the Pacific Northwest, led by a strong local food movement that includes the best farmers’ market in Washington State and a plethora of dedicated small farms. And gosh darn it, over time I have turned most of my yard into a garden, too. Even among the flowers I manage to sneak in some garlic. Throughout the yard, I’ve scattered huckleberries and raspberries, and last year I grew food in the front yard as well as the back, producing a bumper crop of squash, tomatillos, and fava beans from underneath the apple trees. Today I will throw down some — wait for it — carrot seeds. If I’ve become a bit fanatical, blame that damned carrot. It changed everything. Nadine, GREAT post. Does this mean I’ll see you at the Farmer’s Market in UpTown? I love carrots by the way. I did chuckle… Thanks! You bet! My husband and I take a little wagon with us to the market because we buy so much food there. They say every 10 years your tastes change. I used to not like carrots either. Still not a big fan, but I don’t mind eating them, whereas before, I couldn’t stand them. So true! I had bought organic produce for years, but it’s just not the same as locally grown. My husband is fussier than I am about veggies, but he too will eat just about anything we buy at the market. I know just what you mean. I’m a little like that with herbs. Where in the garden can I squeeze in a patch of mint, a little rosemary, maybe some dill. Darn it, I’m getting hungry now! Oh, yes, herbs!!! We just had our front yard fenced in (we have free-roaming deer that like to munch on everything until it’s gone). I brought home all kinds of herbs to plant. It seems like what the yard wants (and me, too). This is a great post, thank goodness you ate that carrott. I was a bit of a weird kid. Before bed I used to have a glass of milk and a raw carrot, hehe. I am indeed grateful for that carrot. What would I have missed out on had I not eaten it? Hmmm, could be a story in there. Hi, Helen! Hope your challenge is going well…I’ll take a look at your blog, too (I’ve been working my way down the list and am trying to catch as many as I can). I love going to the farmers markets and finding “new” veggies to try..
Me, too. Though when I first saw celeriac, it took me a while to give it a go. I took a cooking class at a local restaurant, and my teacher helped demystify it for me. Fresh produce locally grown tastes much better than stuff that has to be shipped from elsewhere. At least, that’s what I’ve heard. It really does. For lunch I harvested asparagus and Swiss chard for part of our meal. Both were exquisite! Wonderful! I always liked raw carrots but had to develop a taste for cooked carrots. Love, love, love this post! Wish I could see your front yard, Pictures? More photos to come as the month progresses! The yard isn’t that aesthetically pleasing yet because we have been duking it out with the deer, but now that we have a fence and plants are waking up, I’ll have more to show. Welcome, Liz! I am so happy to have “real” vegetables again of all kinds. Thanks for sharing the link to your blog. I’ll check it out! love the carrots since I can remember 🙂 It does not matter, Loved your story!!! Thanks! I feel like I’ve missed out on something all these years! Yep, yep…I go for the baby carrots, too.